The office isn’t the healthiest environment to spend 40 or more hours a week. You are sitting in a cubicle without much exercise, are surrounded by sugary snacks and have to deal with a lot of stress. It is important to balance things out by working out. Most office workers have difficulty finding time to work out when they have a regular job. Fortunately, there are a number of ways that you can squeeze in some exercise while you are work. How Can You Work Out in Your Office? Most people would rather go for a run or work in a gym then exercise in their office. However, that isn’t really an option for people who work late hours. Here are some ways that you can get some exercise while you are the office instead. You don’t need any fancy equipment for the raise the roof workout. You will march in place while extending your hands towards the ceiling. This can be a good way to get some quick cardio into your day. However, some people have said that it can be embarrassing if their coworkers come in. Your employer is legally required to let you have a 15 minute break every four hours. You can use this time to go for a brisk walk around the building. You can burn about 100 calories by brisk walking for about 15 minutes. You can use this workout to both get some cardio and release some tension in your upper body. This is particularly helpful for people who spend a lot of time at the keyboard and want to reduce the risk of developing tendonitis or carpel tunnel. You may want to ask your employer if you can buy a treadmill for your office. Some companies will even reimburse you for part of the cost. There are a number of businesses that sell great treadmills such as this that you will want to consider buying. Try doing some hip flexions and leg extensions. You need to sit up straight in your chair and lift your legs straight. You can get a better workout by holding your legs for a couple seconds. You should do about 20 reps to get the most benefit. Do some chair squats while sitting. Lift yourself up so that your hips are slightly over the chair and hold your arms outright. Side bends can be a good way to work out your arms and the sides of your torso. Hold your arms up straight while sitting and lean as far as you can on either side. You can condition your arms better by holding a small weight such as a full water bottle in each hand. 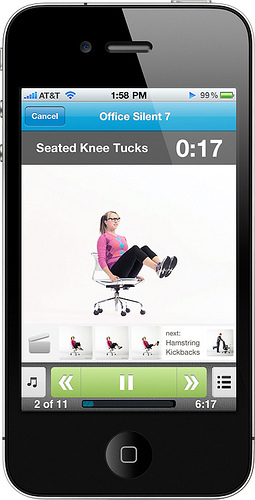 There are a number of ways that you can get a great workout even while you are seated. These are some great ways to get started.